The ability for end-users to register themselves for events is beneficial for both your constituents - they can register at a time and in a place that is convenient for them - and for your organization - reducing administration. This page details the steps involved in offering online registration for events. To offer online registration, check Allow Online Registration in the Online Registration step of event creation and use the options on this form to configure this feature. Define the text to be used as the link from the event information page to the registration form, and set the starting and ending dates for registration. The link text is used in the event information page, and is most commonly "Register Now" or similar. The start and end dates define when web site visitors may register for the event. The registration end date may be different from the start date of the event, as you may want to close registration in advance of the event in order to prepare name tags or perform other administrative functions. Enabling Register multiple participants lets individuals register as many people as they choose for the event and pay the fees with a single transaction. For example, an organization may be sending multiple people to a conference, or an individual may bring their partner and wish to register and pay for both in a single process. By default, this option requires a different name and email address for each person registered. Checking same email address provides the same capabilities, but without requiring distinct email addresses for each registrant. In either case, jManage uses a separate contact record (an existing one if the contact is already in the system, otherwise a new one is created) for each individual registered. Information on the Duplicate matching rule is provided in the Contact matching and duplicate management sub-section of this page (below). Pending participant expiration (hours) is the time for confirming/finishing registration by participants with any of the statuses classed as Pending. It works in conjunction with the scheduled job Update Participant Statuses (see Administer > System Setting > Scheduled jobs). If these are both set, pending registration must be finalized within the set time or the registration will be cancelled and the would-be registrant notified by email of the cancellation. This feature is very useful when combined with scheduled reminders for automatically managing Pending from pay later registrations if you have allowed that payment option on your online registration page. The next step is to define the text and the fields for collecting information that will be displayed on your online registration page. The introductory text comes at the top of the page and the footer text at the bottom. In between will come some, or all, of: profile, fee selection, credit card details, additional profile(s) in that order. By default, when creating an online registration form the profile "Your Registration Info" will be selected as the 'top' profile. This consists of three fields: first name, last name and email address. However, jManage only requires either first name and last name or email address for each contact. So you can modify 'Your Registration Info' or create a new profile with fewer fields. If you choose not to collect email addresses, be sure to uncheck the option "Send confirmation email?" at the bottom! WARNING: If you modify an existing profile whilst configuring your Online Registration page, the changes you make will apply everywhere that profile is being used. So unless an existing profile exactly matches your requirements you should copy the profile, then rename and edit the copy as required. If the profile you require does not already exist, you can create it without leaving the Online Registration configuration page. 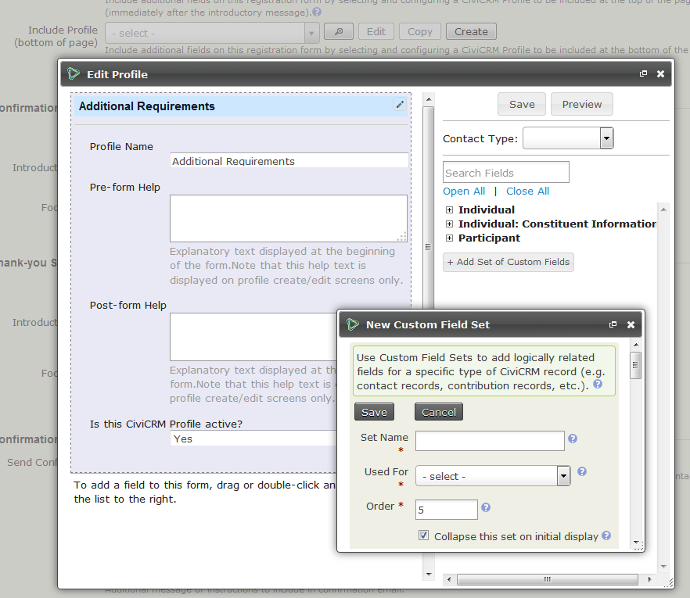 The drag and drop profile interface also allows you to create custom fields to include in the profile if you have not already done so. Custom fields can be created for all events or all participants, or only specific Event Types or Participant Roles (see the chapter Custom data on events in this section for more details on where you should store what custom data). Once you registration page is configured you need to enter the text to be displayed on the Confirmation page, Thank-you page, and emailed confirmations/receipts (if enabled). For free events, the Confirmation step is skipped. For paid events the payment is processed between the Confirmation and Thank you pages. 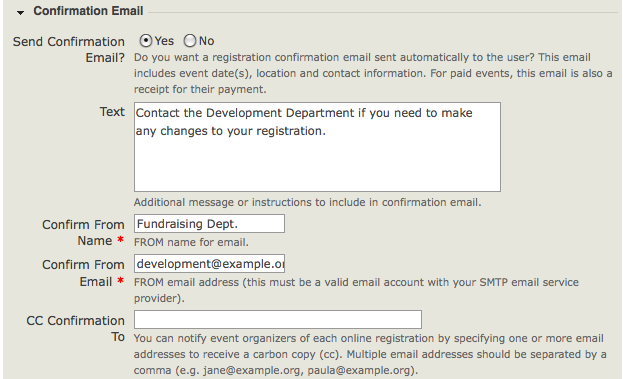 For most events you'll want to enable the Send Confirmation Email feature (see following screenshot). For paid events, the confirmation email also acts as a receipt. Make sure that the Confirm From Email address entered is a valid email account on your mail server. Add one or more staff emails (separating multiple email addresses with commas) to the CC Confirmation To field if you want real-time updates on who is registering for your event. Please note that the contents of the Text field will be included in both TEXT and HTML versions of receipt emails so we do not recommend including HTML tags / formatting here. The following features may be useful to enhance your online event registration process. Your organization may have limits on attendance, such as a 25-person limit for a training workshop or a 200-person limit for a fund-raising dinner. jManage lets you set the maximum number of people allowed to register for your event. When registrations reach that number, jManage will not allow other people to register, but will instead send an automatic message saying, "The event is currently full." This message can be customized by the organization when creating a new event, and you can let people add themselves on a first-come-first-served basis to a waitlist. As space becomes available on your event, for example, if one or more people cancels, then On waitlist participants will be moved to 'Pending from waitlist' status and will be sent an email with a link to complete their registration (including paying event fees - if any). People will remain pending for a certain amount of time defined in Pending participant expiration (hours). This gives them a window of opportunity to register. You can set the amount of time, measured in hours, that you set on the Online registration tab under Pending participant expiration hours. If you want, you can set this to 0 for no limit. After this period of time, they will be moved to expired and other people on the waitlist will be given the opportunity to register. If you'd like to enable the Waitlist feature, you must first enable the related participant statuses On waitlist and Pending from waitlist. You can do this in Administer > CiviEvent > Participant statuses. You can then check the Offer Waitlist checkbox on the Info and settings tab, and set the message you want displayed on the event information page when the event is full. Note that in order for the status processing to happen, you need to have the Update Participant Statuses scheduled job running (see Administer > System Setting > Scheduled jobs). Many events are open to everyone, but there may be times when your organization invites only specific people to the event. For example, you could invite volunteers who have donated 100 or more volunteer hours to an appreciation dinner. The people invited may talk about the event to their friends, and possibly forward the information. With jManage, you can check who has registered and approve only the people invited. If you'd like to enable the 'Participant approval' feature, you must first enable the related participant statuses Awaiting approval and pending from approval. This is similar to what you do for waiting lists and you can do it in Administer > CiviEvent > Participant statuses. You can then check the Require participant approval checkbox on the Online registration tab, and set the message you want displayed in the approval message. You can also limit the amount of time participants have to complete their registration after approval by entering the time in hours in the Pending participant expiration field. For example, if you want to give participants 3 days to complete their registration, enter "72" in that field. Now, when a person registers for the event, they will get a reply that says, "Your registration has been submitted. Once your registration has been reviewed, you will receive an email with a link to a web page where you can complete the registration process." This reply can be customized to your organisation's needs. For more information see Contributions > Personal Campaign Pages. This is the last step in creating an event. Click Save and Done. Whenever we allow people to interact with our database from 'the outside' we run the risk of creating duplicate contacts. There are various ways to deal with this. For example, some websites require you to be logged in at all times when doing important things and we can do the same for jManage using permissions (just take away the register for events permission from anonymous users and give it to logged in users, or a specific role). Depending on the type of event that you are running, this might not be a good idea. Lets say you are running a conference, or AGM and you want as many people as possible to register. Requiring them to log in will decrease the amount of registrations. Lets say, we don't require people to log in to register for an event. Consider the following situation. James Martin registers for an event. James Martin is already in our database. How do we match up the James who is registering with the one that is in the database. What about if there are two James Martins in our database. One that lives in London, and one that lives in Paris. How do we know that we have found the right one? The answer is duplicate rules. You can read more general and more detailed information about duplicates and merging in the Deduping and merging section and we recommend that you get familiar with that chapter at some point. This section just covers contact matching and duplicate management in the context of jManage Events. By default, jManage uses the Unsupervised rule to do matching. When you configure an event for online registration, you can override the default by selecting a different duplicate matching rule for matching participants for this particular event. The rule you select takes effect for the primary participant and any additional participants. The Online Registration tab checks for whether the included profiles have enough fields to have a chance at matching participants to existing contacts. It reviews the possible combinations of matching fields that would satisfy the matching rule in effect for the event, and it checks to see if any of those combinations is present among the fields in the included profiles. The warning "Duplicate Matching Impossible" appears if there's no way to match duplicate contacts using the rule, while the warning "Duplicate Contacts Possible" appears if enough fields are there but not all of them are required. If you've enabled online registration for events on your site you need to review the Drupal user permissions to ensure that visitors are able to view event information and complete the registration forms. Navigate to Administer > Users > Permissions. view event participants - required if you want to display a listing of registered participants. If you want to exclude anonymous visitors from viewing or registering online for events, assign these permissions to an authenticated user role. If you need to limit access control for specific events to a specific group of contacts, this requires a custom configuration by Jvillage. Please contact support for details and a quote. From Event Links, select Test-drive to test the registration page. Test-drive mode will use the sandbox options for your payment processor, if available, and will create a registrant record with a test indication so that it can be reviewed and easily removed. Fill out the registration form and complete the registration process. In order to find the new test participant record, navigate to Events > Find Participants. In the search criteria, check the box Find Test Participants. If you need to adjust the event settings, navigate to Events > Manage Events and click the Configure link for this event. If you discover elements that you need to edit and adjust, select Configure to return to the list of event setting pages. 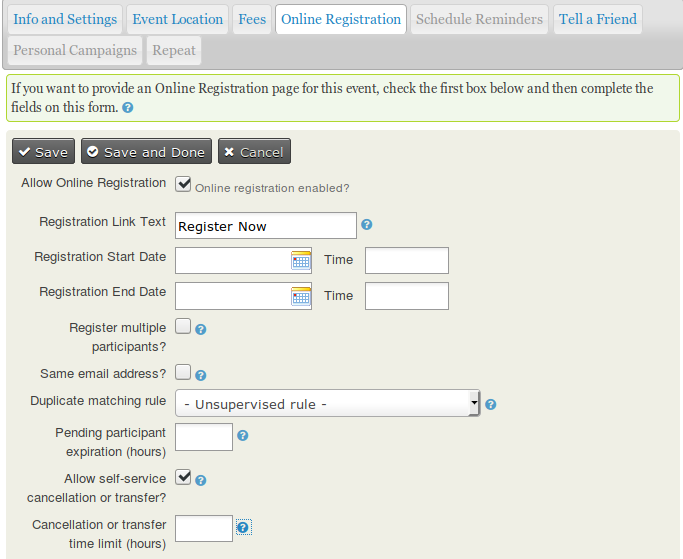 If you have events where anonymous users register for events, you should also test the registration when not logged in. Refer to the Event Permissions information later in this chapter for details. Once you are satisfied with the event information and registration form, it's time to display it on your website.